The British Ambassador to Spain, Simon Manley (left) together with Kevin Baker (middle) and Gebhard Leidenfrost (right), F4E, in front of the ITER tokamak model. F4E welcomed the British Ambassador to Spain, Simon Manley, to its headquarters in Barcelona. 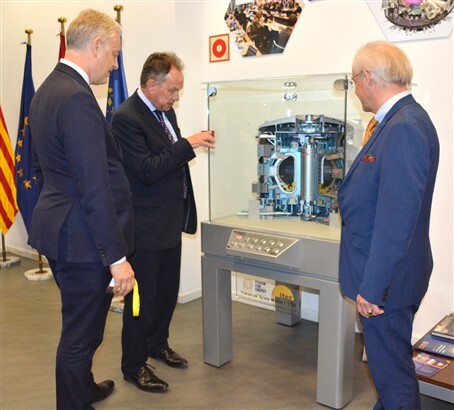 Together with a group of British Foreign Office colleagues, the Ambassador met with F4E Senior Management and attended presentations about the work of F4E and the ITER project. The Ambassador also took the opportunity to meet British members of F4E staff for a chat in an informal setting during his visit. "I am delighted to be at F4E today and to meet British scientists and engineers working here in cutting-edge technology", he said. The Ambassador and a group of British Foreign Office staff attended presentations about the work of F4E and the ITER project. The Ambassador also took the opportunity to meet British members of F4E staff for a chat in an informal setting.